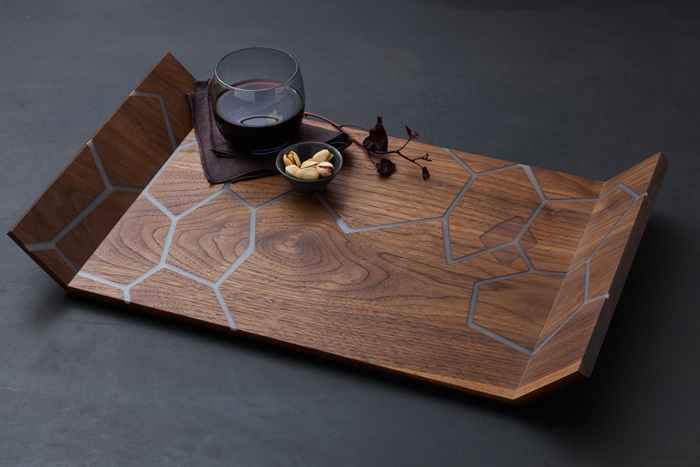 “The Honeycomb Tray comes in walnut with translucent white or translucent black resin. It also comes in maple with pink or translucent black resin. "About a year ago, we became very interested in hexagonal shapes which led us into an exploration of Voronoi patterns, from soap bubbles to dragonfly wings. At some point in our exploration we used advanced pattern replication software to sketch out potential designs. But the final design is hand-drawn, and is the result a dialogue between the constructed regularity of beehive hexagons versus the seemingly irregular geometric patterns which occur in other biological forms. "The patterns are carved with a custom-built pantographic router. A hand-carved original is mounted on one side of the machine and each copy is meticulously traced and carved from that original, one after the other, kind of like monks duplicating manuscripts. Resin is poured into the carved grooves, then sanded smooth. "—N.G.